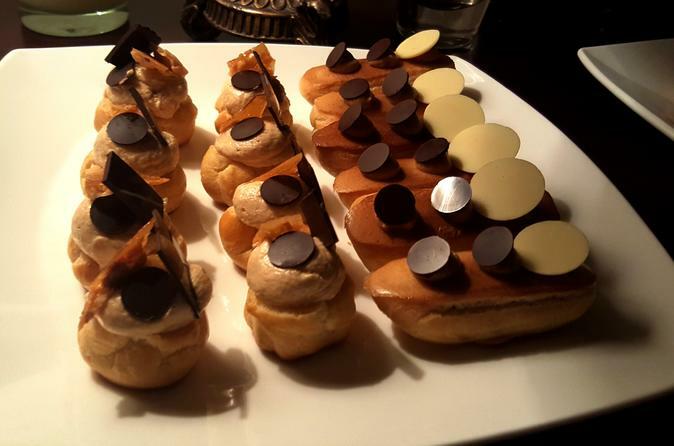 Make Rustic And Timeless Eclairs And Exquisite Cream Puffs! This is a hands-on event and you are welcome to participate in making rustic and timeless éclairs and cream puffs with me. I’ll share any tips that you wish to know about pate a choux—the light dough used to make pastries—in addition to telling you some of my party making ideas. This is a fun and friendly class; so let’s get cozy among friends and some wine. I’m a winner of the esteemed French MOF—Meilleurs Ouvriers de France Pastry title, who has had the honor of serving political leaders and VIP clients over the course of my 25 years as the owner of several pastry shops in San Francisco. I published a French pastry cookbook and I'm ready to share with you the fun of combining sugar, eggs, flour, and chocolate—and then voilà. Chef Jean Yves Duperret grew up in France in the medieval city of Tours. He graduated from a famous engineering school, one of the best French university-level institutions in the field of engineering & science. He worked in Paris, France, as an Engineer before realizing that his true passion was the art of French pastry. He started his career alongside his stepfather who taught him rudiments of pastry. He then reinforced his skills working for prestigious French pastry shops and winning national contests, until being nationally awarded into his profession. Creating gourmet French desserts has enabled him to ally his artistic talent with his mind for logistics and efficiency. Chef Jean-Yves Duperret is one of the pioneer pastry Chefs in the Bay Area. He opened the pastry shop La Nouvelle Patisserie in 1984 in the Marina District and was its Chef for more than 25 years. La Nouvelle Patisserie was an iconic spot in San Francisco for French traditional delicacies. Gourmets could be tempted by scrumptious masterpiece cakes, elegant Napoleons, light mousse cakes, macaroons, canelés, financiers, fresh Madeleines, fruit tarts…Chef Jean-Yves is also the author of the book La Nouvelle Patisserie: The Art and Science of Making Beautiful Pastries and Desserts. Chef Jean Yves is recognized as one of the best ambassadors of French pastry in the Bay Area. Life is a journey, don' t run and take the time to live !